In a little over an hour, I have just read one of the wackiest, most sarcastic and fun books ever! 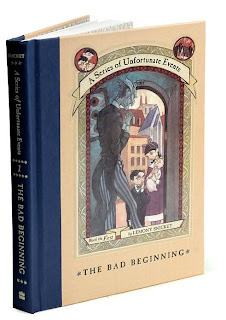 The Bad Beginning, Book the First in Lemony Snicket's popular A Series of Unfortunate Events series is a gem - I adored it. The book tells the story of the Baudelaires - Violet, Klaus and Sunny - who are orphaned when their parents die in a tragic fire. Mr. Poe (who, naturally, has a boy named Edgar), the executor of the Baudelaires' will, informs the children that they will be sent to live with their closest relative (closest geographically, that is), Count Olaf. Never having heard of the man, the children are a little anxious at this news. When Mr. Poe drops them at their new home, their anxiety turns to out and out fear. Count Olaf proves to be a strange, menacing host in a filthy, crumbling mansion. 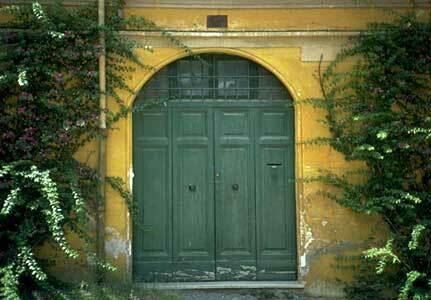 It s oon becomes apparent to the children that the Count is after one thing - the fortune their parents left them. While feeding them only lumpy oatmeal and making them do horrendous chores, Count Olaf is hatching a nefarious plan to capture the money, a plan he reveals by innocently asking Violet to co-star with him in a theatrical production of The Marvelous Marriage. When Klaus discovers the evil plan, Count Olaf locks baby Sunny in a cage hanging from a 30-foot tower to ensure the children's cooperation. 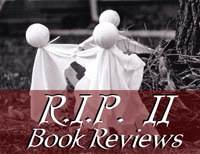 With no one to turn to, Violet and Klaus must save themselves and their baby sister. The only question is, how? And will they figure out what to do before Violet becomes the legal wife of the sinister Count? Book Ninja recommended having all of the sequels on hand when reading this series, and I'm glad I took her advice. I can't wait to see what happens in the next one and the next one...It's just such a fun series. It's written in a fun, mysterious, playful voice that just makes the book a sheer pleasure to read. When I finish the series (sometime tomorrow, probably), I'll review it in total. For now, go out and get this book. It's fast, fun and eerie enough to fit in perfectly with the R.I.P. Challenge - what's not to love? I've got to admit, I didn't care for this. The part about where the uncle was holding his neice hostage until she married him was a bit much. However, I was looking at it through the eyes of a teacher reading it out loud to third graders, and it just didn't fly for me. All this said, several children in my classes have loved this series! I also adored this book, but for some reason I never got around to reading the rest of the series. I definitely need to change that! Bellezza - I agree, Count Olaf's marriage proposal to his niece was a little creepy, but he didn't do it out of lust for her, but for the money. The whole situation was ridiculous - obviously would never happen - but that's how it goes in the wacky world of Lemony Snicket. Nymeth - I've got the 2nd and 3rd books on my nightstand. Can't wait to read them. Goodbye, Glass Books, May You R.I.P.